While Joan was still in Japan, I received a package of persimmons from a great friend, who had gotten them from her friend in California, who has a wonderful tree. But they came with a stipulation: I was required to make a dish incorporating persimmons to be photographed and sent to the person with the tree for her judgment. Two others were included in the competition, both far more experienced than I; indeed, one has a well-known pastry shop in New York. 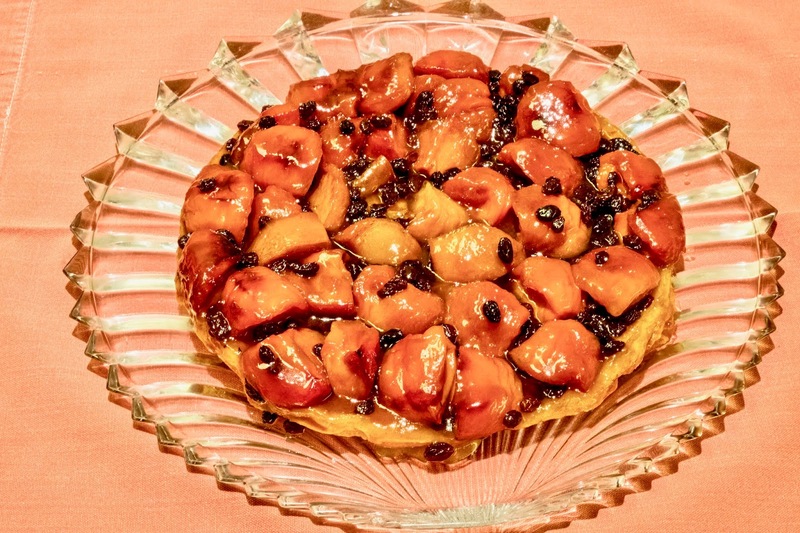 I thought about this for a couple of days and decided to make a tarte tatin using persimmons instead of apples. I used the basic techniique from the Confrérie des Lichonneux de la Tarte Tartin (Brotherhood of Tarte Tatin Lovers), with some brilliant additions from Paula Wolfert's The Food of Morocco, namely the addition of dried currants (Wolfert uses raisins but I wanted something less sweet) and orange flower water. but the persimmons were a bit mild-tasting for this dessert, being a bit overwhelmed by the bitterrness of the caramelized sugar and the heavily scented orange flower water. If I make it again . . . 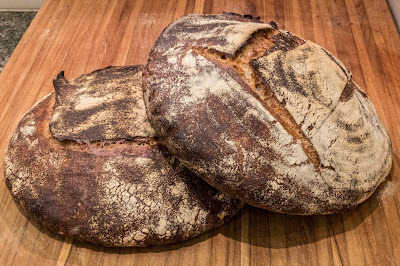 When Joan's away I like to bake bread, so I made some levain country rye loaves from Chad Robertson's iconic Tartine Bread. It is so satisfying to get loaves that look like this, and have that sour taste that can only be found in a genuine levain bread. A serious scheduling problem, since the process takes about 24 hours and has a number of steps, but worth it when it comes out.